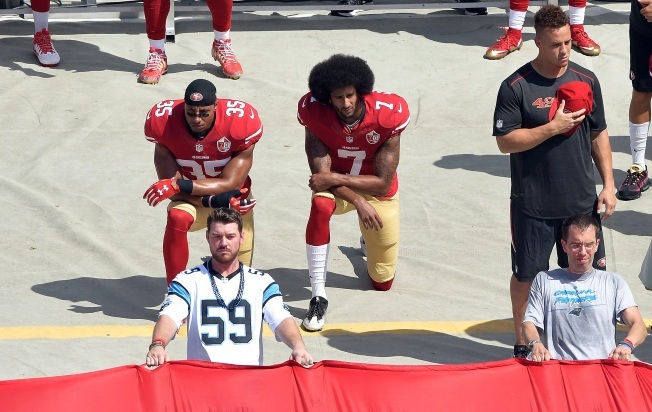 San Francisco 49ers players Colin Kaepernick (center) and Eric Reid (left) kneel during the national anthem before their game against the Carolina Panthers at Bank of America Stadium on September 18, 2016, in Charlotte, North Carolina. San Francisco 49ers quarterback Colin Kaepernick graces the cover of Time magazine next month, at the same time a new poll shows he’s the most disliked player in the National Football League. This dichotomy of pride and disdain mirrors the country's reaction to Kaepernick’s controversial decision to not stand during the National Anthem at football games this summer. Some support his stance, which he said is meant to highlight the issues of police brutality and unfair treatment of people of color in the United States. "He's shedding light on a situation that is heinous, it shouldn't happen in this country," 49ers head coach Chip Kelly said. In his most detailed comments on the issue to date, Kelly on Thursday said he stands behind Kaepernick's ongoing protest. "You look at what's going on in Tulsa and Charlotte in the last two nights — it's an issue that's in the forefront of our country," Kelly said. "It needs to be addressed. It needs to be taken care of because it's not right." Oakland City Councilmember Rebecca Kaplan is also following the quarterback's lead. When her colleagues stood for the Pledge of Allegiance at Tuesday's council meeting, she sat down. "Part of my motivation for sitting in solidarity with him is to say, 'What you're doing is good. Don't worry about the haters because we need to stand up for justice,'" Kaplan said. However, Kaepernick has faced plenty of criticism with some even making death threats in response to a civil protest they deem unpatriotic. 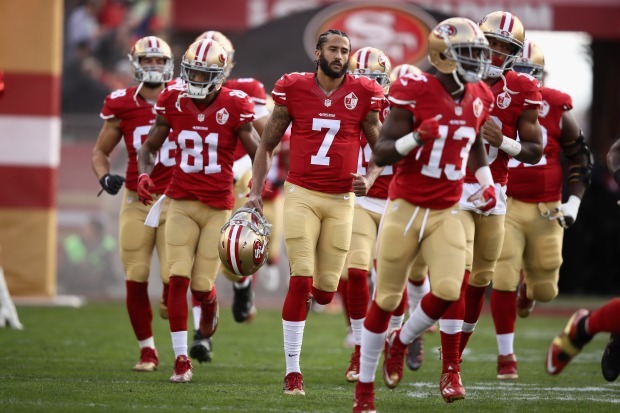 A poll last week of Americans by E-Poll Marketing Research revealed that Kaepernick was "disliked a lot" by 29 percent of the 1,110 people polled, more than any of the more than 350 players asked about in the survey. In the dislike category, Kaepernick finished ahead of Tampa Bay Buccaneers quarterback Jameis Winston (22 percent), Miami Dolphins defensive end Ndamukong Suh (21 percent), New England Patriots quarterback Tom Brady (13 percent) and Pittsburgh Steelers quarterback Ben Roethlisberger (10 percent). In August 2014, the last time the poll was taken, Kaepernick was only "disliked a lot" by 6 percent of the population. However, among African-Americans, Kaepernick has never been more popular. The poll shows 42 percent of African-Americans now say they like the 49ers quarterback "a lot," while only 2 percent dislike him "a lot." Two years ago, only 16 percent of African-Americans said they liked Kaepernick "a lot," while 3 percent disliked him "a lot."